Novel topical formulations of minoxidil comprising minoxidil; a solvent for minoxidil; a non-polar solvent which renders the formulation approximately the same polarity as human sebum; and a cosolvent which enhances the delivery of minoxidil through the stratum corneum. The present application provides a novel composition of matter. More particularly, the present application provides a new formulation for known pharmaceutical products. Most particularly, the present application provides a topical composition containing minoxidil which dissolves sebum, the oil surrounding the hair follicle, and provides a means for penetrating the outer skin layer, the stratum comeum. (d) a cosolvent having a polarity between that of the solvent capable of dissolving minoxidil and the non-polar solvent, which enhances the delivery of minoxidil through the stratum comeum, said cosolvent in an amount less than that which causes skin irritation. The present invention thus provides a non-aqueous topical minoxidil formulations having improved efficacy. By minoxidil is meant the 2,4-pyrimidinediamine, 6-(1-piperidinyl)-3-oxide, analogs as well as salts thereof, as described in U.S. Patents 4,139,619, and 4,596,812, which patents are expressly incorporated by reference herein. Suitable solvents for minoxidil include propylene glycol, 1,3- butylene diol, polyethylene glycol 200 (PEG 200), polyethylene glycol 400 (PEG 400), isopropanol, ethanol, methanol, 1,5 pentane diol, 1,2,6-trihydroxyhexane, 1,7-heptanediol, 1,4 butane diol and Nmethylpyrrolidone and related compounds (see, e.g., J. Pharm. Pharmacol. 37:298-304 (1985). Suitable non-polar solvents include silicone oils such as the following volatile silicone oils: Dow Coming - 344 fluid; Dow Corning - 345 fluid; Union Carbide - V.S. 7207; Union Carbide - V.S. 7158; and Union Carbide - V.S. 7349, and the following nonvolatile (or less volatile) silicone oils: Dow Corning - 200 fluids of various viscosities; and Union Carbide - L-45 fluids of various viscosities. Suitable cosolvent/penetration enhancers include alcohols, such as butanol, hexanol, όctanol, decanol, dodecanol and oleyl alcohol; amines, such as isopropyl amine, diisopropyl amine, triethyl amine, triethanol amine and ethylene diamine; carboxylic acids, such as oleic acid, linoleic acid and linolenic acid; esters, such as dibutyl sebacate, dibutyl phthalate, butyl benzoate and ethyl caprate; and others, such as AZONE®, N methyl pyrolidone, bile salts and urea. Oleyl alcohol is the preferred cosolvent. To aid in the miscibility of the components, preferably an additional cosolvent is added to the cosolvent having a polarity between the minoxidil solvent and the non-polar solvent oleyl alcohol. Thus, for oleyl alcohol, the preferred penetration-enhancer and cosolvent:, isopropanol is the preferred additional cosolvent making a miscible solution with volatile silicones (e.g. Dow Corning 344 fluid). The isopropanol is used in the range of from 16 to 27% and makes single phase solutions of all mixtures of interest. The volatility of the isopropanol reduces some of the oiliness caused by the oleyl alcohol, since lesser amounts of oleyl alcohol need be used in these formulations to make a miscible solution than were used prior to the addition of isopropanol. Ethanol can also be used as a less chemically "smelling" cosolvent for these vehicles, but ethanol must be present at concentrations 5-10% greater than isopropanol and the resulting vehicle is not as effective in solubilizing sebum. Sebum is the relatively non-polar material excreted from the sebaceous glands located in the hair follicle. In order to stimulate hair growth, it is desirable to target topical minoxidil formulations to the sebaceous glands. The present composition, which is miscible with human sebum, accomplishes this purpose. Hildebrand solubility coefficients (HSC) (see Vaughn, J. Soc. Cosmet. Chem. 36:319-333 (Sept/Oct 1985)) are used to characterize a miscible vehicle using a sebum solubilizing agent of low (i.e. nonpolar) Hildebrand solubility coefficient in combination with a skin penetration aid with a Hildebrand solubility coefficient intermediate between that of the non-polar sebum solvent and the more polar minoxidil solvent. The resulting vehicle has Hildebrand solubility coefficient close to that of human sebum and can completely solubilize the amount of sebum on the scalp. The currently used more polar vehicles for minoxidil cannot solubilize this amount of sebum. Based upon the composition of synthetic ('or artificial) sebum, the Hildebrand (HSC) solubility coefficient for sebum is about 7 or 8 cal ½ cm -3/2 Minoxidil shows its best solubility in propylene glycol which has an HSC of 14. Miscibility (the ability of two or more liquids to mix in all proportions) is shown on this scale typically when there is a difference of 2 units. Therefore, in order to lower the HSC of the vehicle from that of pure propylene glycol down to 2 of sebum, a solvent with HSC below that of sebum must be chosen. One of the most suitable solvents is volatile silicone oil with a HSC of about 5.8-5.9 Since the silicone oils are totally immiscible with the propylene glycol, it is necessary to add a cosolvent to render the two more miscible. This cosolvent could have only HSC between 6 and 14, however, the midpoint (about 10) should require the smallest amount of cosolvent and is thus preferred. 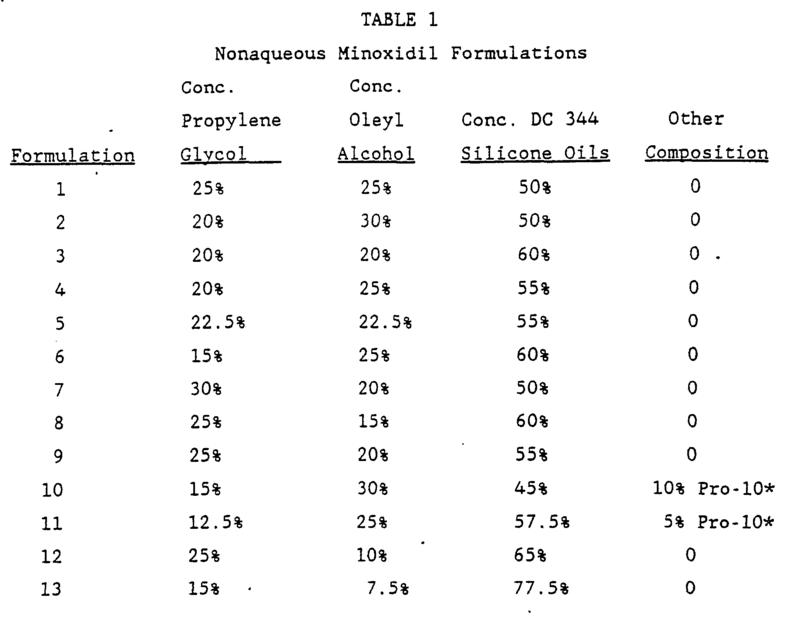 Minoxidil is not well absorbed through the skin in the prior art formulations (e.g., propylene glycol/ethanol/water). Thus, addition of a vehicle component that enhances skin penetration as well as renders the silicone oils and propylene glycol miscible is desired. Most preferable is oleyl alcohol, having an HSC of 9.8. A single phase (i.e. solution) formulation can be prepared from these materials. This vehicle can completely solubilize the sebum levels on the skin whereas previous minoxidil formulations do not dissolve the amounts of sebum reported to be on the scalp. 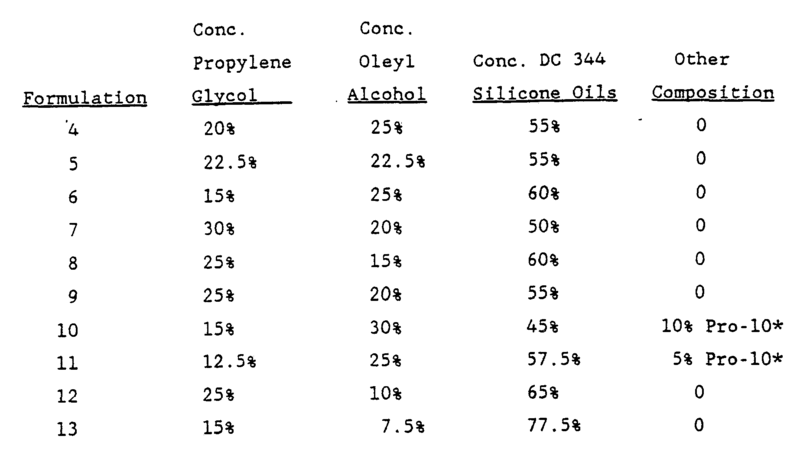 For purposes of skin penetration, it is desirable to have less oleyl alcohol in the formulation (e.g., approximately 1:1 ratio of oleyl alcohol to propylene glycol). However, the formulation is not miscible at the 1:1 ratio. A single phase system (at 1:1 oleyl alcohol:propylene glycol) can be prepared by adding some nonvolatile silicone oil (e.g., Dow Coming 200 fluid) and a surfactant (e.g., Union Carbide SILWET L-77). Further, high concentrations of oleyl alcohol are dermally irritating. Thus, concentrations of oleyl alcohol of from about 10 to about 40% of the total solution are preferred. It is more preferred for cosmetic acceptability to use less than about 20% oleyl alcohol, so that the composition has a less oily "feel". Based upon in vitro transdermal data, the concentration of minoxidil should be from about 1.0% to 2.5%; the concentration of propylene glycol from about 12% to 25%; and the concentration of oleyl alcohol from about 6% to 20%. These vehicles give in vitro human skin transport levels of minoxidil that range from about equal to the current 2% minoxidil formulation (20% propylene glycol/60% ethanol/20% water) to approximately 10 fold greater transport, as seen by Example 2. (Step 1) Propylene glycol is measured and added to a suitable container. (Step 2) Propylene glycol is heated to 52° -58° using a water bath, and heated for 10-15 min once the temperature has reached the required range. (Step 3) Minoxidil is weighed and added slowly to the heated propylene glycol with rapid mixing. Mixing continues until the minoxidil is completely dissolved (approx. 30-40 min). Temperature is maintained at 52°-58°C using the water bath. (Step 4) The minoxidil-propylene glycol solution is cooled to room temperature (approx. 25ºC) . (Step 5) Oleyl alcohol is measured and added to the cooled step 4 solution and mixed for 1 min. (Step 6) If procetyl-10 is added, it is added to the step 5 mixture and mixed for 1 min at this point. (Step 7) Dow Corning 344 is added to the above mixture and mixed for 5-10 min until a uniform mixture is obtained. Vehicle Composition (Vol%) Transport* Propylene Glycol Oleyl Alc. IPA Vol . Silicone High (~12X) 25 15 27 33 Medium (~4X) 15 7.5 25 52.5 Low (~1.5X) 12 6 25 57 * Vehicle transport is defined as the ratio of the peak (1 hr) transport flux measured for minoxidil through human cadaver skin for the vehicle listed divided by the "standard" reference vehicle (20% propylene glycol/60% ethanol/20% water) peak minoxidil transport measured on a portion of the same piece of skin. The weight percent of minoxidil in each of these formulations is: 2.3% for the high transport; 1.3% for the medium transport; and 1.1% for the low transport vehicle, while the reference vehicle contains 2.0% minoxidil. Using the procedures of the preceding Examples, and techniques known in the art, the following compositions are prepared. (All concentrations are in volume percentages (volume %)). *Pro-10 = Procetyl-10 (propylene cetyl ether) surfactant added to initial emulsions to improve stability. (d) a cosolvent having a polarity between that of the solvent capable of dissolving the minoxidil and the non-polar solvent, which enhances the delivery of minoxidil through the stratum comeum, said cosolvent in an amount less than that which cause skin Irritation. 2. A composition of Claim 1, wherein the solvent capable of dissolving minoxidil is propylene glycol, the cosolvent is a mixture of oleyl alcohol and isopropanol, and the non-polar cosolvent is a volatile silicone oil. 3. A composition of Claim 2, wherein the minoxidil concentration is from about 1.0 to about 2.5% volume %, propylene glycol is from about 12 to about 25% volume %, oleyl alcohol is from about 6 to about 20 volume % w/w, and the isopropanol is from about 16 to about 27 volume %. AT87905890T AT74264T (en) 1986-09-05 1987-09-02 Sebum-dissolving, non-aqueous minoxidilformulierung. DE19873778027 DE3778027D1 (en) 1986-09-05 1987-09-02 Sebum-dissolving, non-aqueous minoxidil-formulation. ES2293667T3 (en) 2008-03-16 Use of an emulsifier system for increasing penetration flux of pharmaceutical agents. ES2240634T3 (en) 2005-10-16 Compositions of topical administration with external reservoir forming active ingredient, its preparation as well as their use.